1. Register for a Sheinside account. Click HERE! 2. 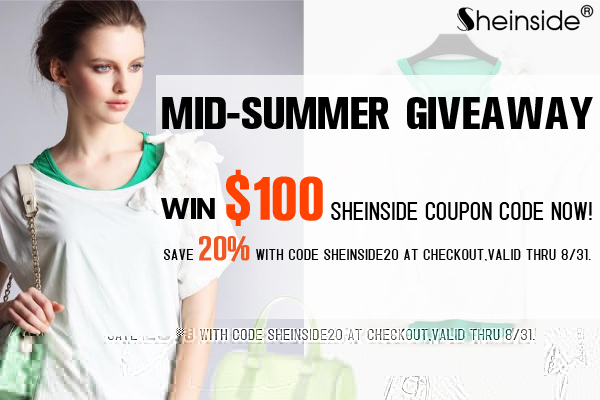 Leave the link of your favorite Sheinside item below. 4. Leave a comment under this post with your name, email address (same one you used to sign up). Contest open to everyone (including international readers!) Ends on July 23, 2012. Goodluck! [x]Register for a Sheinside account. [x]Share this giveaway on your blog, facebook or twitter. Leave a comment under this post with your name, email address (same one you used to sign up). mi favorito: http://www.sheinside.com/Goddess-Chiffon-Oblique-One-Shoulder-Pink-Full-Length-Dress-p-80390-cat-1727.html and a lot of other stuff. lol.